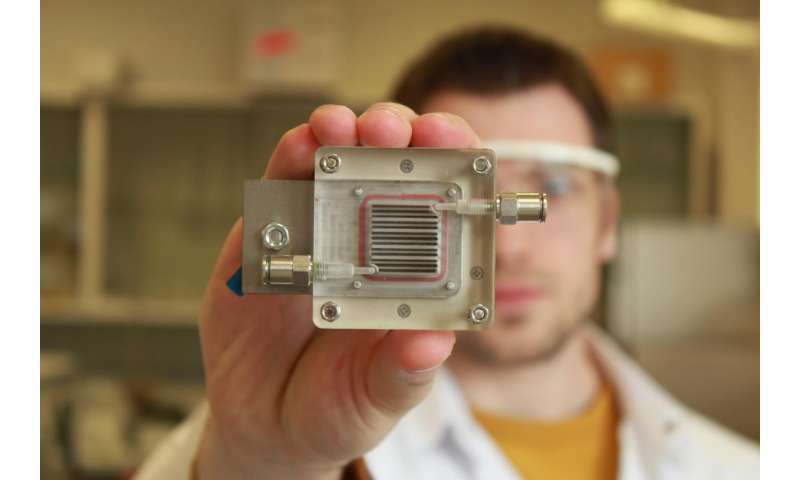 Researchers from the University of Antwerp and KU Leuven (University of Leuven), Belgium, have developed a process that purifies air, and at the same time, generates power. The device must only be exposed to light in order to function. "We used a small device with two rooms separated by a membrane," explained professor Sammy Verbruggen (UAntwerp/KU Leuven). "Air is purified on one side, while on the other side, hydrogen gas is produced from a part of the degradation products. This hydrogen gas can be stored and used later as fuel, as is already being done in some hydrogen buses, for example." In this way, the researchers respond to two major social needs: clean air and alternative energy production. The heart of the solution lies at the membrane level, where the researchers use specific nanomaterials. "These catalysts are capable of producing hydrogen gas and breaking down air pollution," explains professor Verbruggen. "In the past, these cells were mostly used to extract hydrogen from water. We have now discovered that this is also possible, and even more efficient, with polluted air." The process seems more complex than it is; the device need only be exposed to light. The researchers' goal is to use sunlight, as the processes underlying the technology are similar to those found in solar panels. The difference here is that electricity is not generated directly, but rather that air is purified while the generated power is stored as hydrogen gas. "We are currently working on a scale of only a few square centimetres. At a later stage, we would like to scale up our technology to make the process industrially applicable. We are also working on improving our materials so we can use sunlight more efficiently to trigger the reactions." This makes me think it may be possible to create some kind of bolt-on attachment to gasoline engine Exhaust manifolds, that will clean the exhaust and produce energy at the same time. Perhaps you could just route the hydrogen back into the combustion chamber and increase efficiency. Just a thought. Glad there is progress in combination Energy-Producing and Environment-Cleaning in one device! Make a clean environment profitable and the Earth will be clean in no time, LOL.